Avocados, mixed with onion, garlic, lime, and cilantro, into guacamole and then spiced up with serrano peppers. I thought I'd try something a bit different and make the same food - guacamole - 4 ways over 4 weeks. I'll use recipes inspired by Alton Brown, Emeril Lagasse, Ina Garten, and Tyler Florence. I've adjusted all the recipes for just one avocado, but you can scale up and use more if you'd like. To me, guacamole only has a few rules. 1 - Use ripe avocados. Avocados don't ripen on the tree, but you'll know an avocado is ripe when it yields to gentle pressure. 2 - Don't puree the guacamole. A bit controversial, but I've never had a good guacamole puree. Each part is expected to mix with the others, but as in life, some boundaries should be maintained. 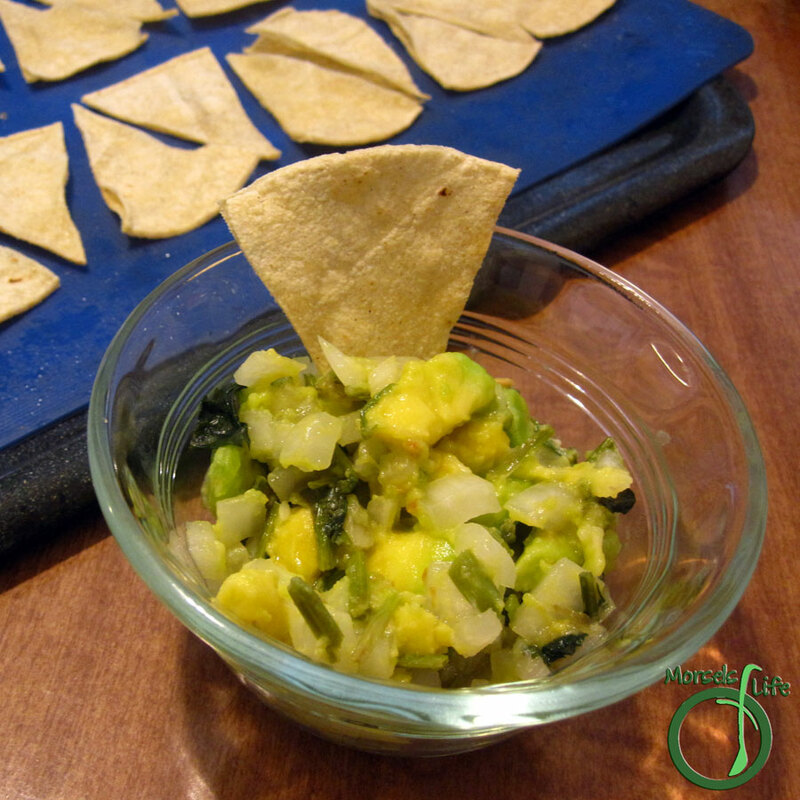 Guacamole dates back to the ancient Aztecs, who called it an avocado sauce, or ahuacamolli. In fact, some hypothesize the Aztecs considered avocados aphrodisiacs - no wonder it's so popular! With its long history, we're exploring four interpretations of guacamole. Continuing from last week's guacamole, we'll make a guacamole with cilantro this week. In addition to cilantro (and the usual suspects), this guacamole has a bit of kick from serrano peppers. Serranos have a bright, crisp flavor, spicier than a jalapeno. Cilantro further brightens Guacamole, Version 2. In fact, cilantro contains antioxidants, which not only have health benefits, but also slow food spoilage. Traditionally, cilantro was also used to treat anxiety and insomnia (Iran), as a diuretic (India), as well as a carminative and digestive aid. In addition, it can help treat diabetes and lower cholesterol and triglycerides. Do you like your guacamole spicy? Cut avocados in half, removing the pit and skin, then cut into chunks. Combine with remaining materials and mix to desired consistency.